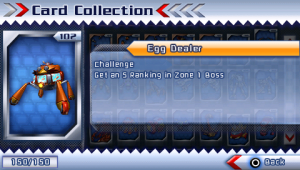 The Egg Dealer is one of the three possible end bosses of Shadow the Hedgehog, the other two being Black Doom & Sonic and Diablon. It is fought in endings where Shadow has aligned himself either slightly or barely with either of the other two parties or by simply getting to the goal ring in every level (which all represent the neutral mission). 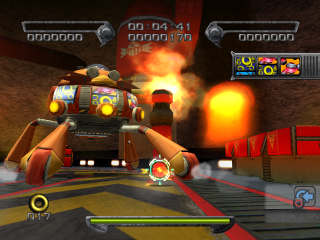 It can be fought after completing the Hero mission in Black Comet (a semi-Dark level), either mission in Lava Shelter, or the Dark mission in Cosmic Fall (a semi-Hero level). This spider-like machine is proclaimed by Eggman as (again) his latest, greatest creation; a quick-wheeling multipurpose weapons platform, stocked full of rockets and mines. Perhaps in reference to the Doctor's casino proclivities, the Egg Dealer selects its attacks with a slot-machine style mechanism controlled by three seperate buttons. If Shadow hits the third button before the reels stop via a long-range Homing Attack, the munitions target Eggman instead of Shadow. After taking the Hero mission and helping GUN forces penetrate to the heart of the Black Comet, Shadow and Knuckles are shocked to discover not Black Doom, but quite questionably, Eggman at the core of the planetoid - presumably there to steal the aliens' Chaos Emeralds in the confusion. The Doctor congratulates Shadow on having done such a good job gathering up six of the Emeralds for him; but now it's time to hand them over. Predictably unenthralled at the prospect, Shadow declines, and the Robotnik decides to teach him a lesson. On victory here Shadow decides that "I and only I know what is best", and karate-chops Eggman into oblivion for his presumptiveness. The Egg Dealer is the final boss for both Hero and Dark missions in Lava Shelter. In these routes, Shadow has been successfully convinced by the Doctor that he is in fact a Shadow Android; however, far from inclining the hedgehog to obey his creator, this only serves to nurture in Shadow an E-123-style patricidal intent. Fittingly enough then, this fight is concluded with Omega's help, as the two robots team up to take down their obese maker. After the Hero battle, Shadow declares that he will take over the Eggman Empire as Shadow Android, turning it into a robotic hegemony - much like Metal Overlord's plan in Sonic Heroes. The Dark ending meanwhile sees Shadow resolve to use the power of the Chaos Emeralds to become stronger than the original Shadow. As in Black Comet, both these endings see Shadow and Omega terminate their creator in an act of gratuitous robotic insurrection. Take the dark mission and Dr. Eggman pops up with his Egg Dealer; why he happens to be on the ARK is, just like the Black Comet fight, a pure coincidence. The Doctor tells Shadow that although the hedgehog was a marvel of his grandfather's science, it's his time now, and offers to spare Shadow's life in exchange for his six Chaos Emeralds. And he doesn't take refusal well, launching into battle determined to stop Shadow from tarnishing his granddaddy's legacy. After summarily trashing the Doctor's ridiculous machine, Shadow gathers all seven Chaos Emeralds, concludes that he is the ultimate lifeform created by Dr. Gerald Robotnik and takes up the helm as the Knuckles-style hermetic guardian of the ARK. The cantankerous Eggman is allowed to live this time, on the condition that he never again sets foot aboard the space station.